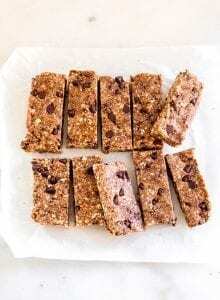 These delicious, soft and chewy, no-bake granola bars are made with healthy ingredients like oats, pure maple syrup, tahini and raisins. Try them with chocolate chips for a special treat. Perfect for dessert, fuel on the go or as a pre-workout snack. Place the rainins in a food processor and mix until they start to break down. Add everything else, expet the chocolate chips and mix until everything is well broken down and starting to form a dough. Add the chocolate chips and pulse a few times to mix. Press firmly into a saran or parchment-lined baking pan. Remove, lift from pan and cut into 10 bars. Store in the fridge in a container.